Location: North central Allegany County, Town of Hume, 0.7 of a mile west of Route 19A. Park along Allegany County Road 27 (Wicsoy Road) on the south side of the creek. 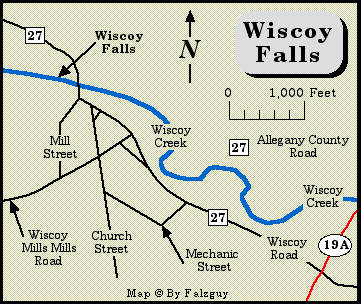 The four falls of Wiscoy Creek can only be viewed from a bridge over the creek. From the crest of the first falls, far in the distance, to below the bridge the creek drops a total of 51 feet. When the trees are free of leaves you can catch a glimpse of a 27 foot high dam above the first falls.